1- 6 participants: 1,500 NIS or 1,300 NIS for tourists. 7 - 8 participants: 1,850 NIS or 1,580 NIS for tourists. 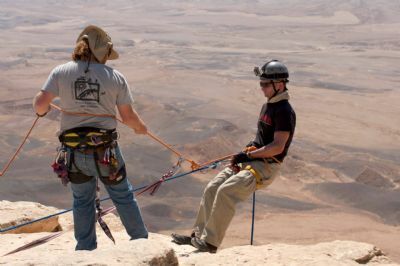 Package deal Option 2: combines 4 hour guided jeep tour and the introductory rappel. 1 - 6 participants: 1850 NIS or 1,580 NIS for tourists. 7 - 8 participants: 2,100 NIS or 1,800 NIS for tourists. Tourist price, 17% VAT deduction, requires presentation of a valid entry visa and foreign passport.